METTLER TOLEDO is proud to sponsor the IMEKO XXII World Congress “Knowledge through Measurement” Sept 3rd – 6th, 2018. Join us in the capitol city of Northern Ireland to learn latest news on the redefinition of the kilogram or discover innovative solutions improving the knowledge gained through measurements. Participate and experience how automation simplifies daily tasks eliminating process uncertainty and ensuring standards traceability. Greifensee, Switzerland—August 1, 2018—METTLER TOLEDO is honored to participate as a Gold Sponsor at the IMEKO 2018—XXII World Congress. We invite you to our booth learning how innovative instruments and compliant software can help weight manufacturers, private calibration laboratories, and national metrology institutes overcome day-to-day processing obstacles to save time, and reduce costs while enhancing accuracy. Booth experts will demonstrate several technology and process solutions including METTLER TOLEDO e5 Robotic Mass Comparator supporting the implementation of LEAN principles as well as improving efficiency, accuracy and traceability of your mass calibrations. 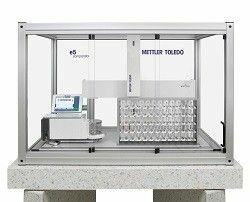 Additionally METTLER TOLEDO presents the XPR Manual Mass Comparator Portfolio with the brand new - 2018 introduced - XPR206CDR, all comprehending MC Link allowing maximizing productivity of your calibration lab. MC Link software guides operators seamlessly through manual weight calibration and reducing labor and time by up to 60%. To register for the Sept 3rd event, visit www.imeko2018.org. We look forward to seeing you in Belfast! IMEKO is a non-governmental federation of 42 Member Organizations individually concerned with the advancement of measurement technology. Its fundamental objectives are the promotion of the international interchange of scientific and technical information in the field of measurement and instrumentation, and the enhancement of international co-operation among scientists and engineers from research and industry. For more on IMEKO, please visit www.imeko.org. For more on IMEKO 2018 September 3rd – 6th in Belfast including the plenary session schedule, please visit www.imeko2018.org.